I was watching a show called Wildest Africa couple of weeks ago and the episode 3 show cases – Ngorongoro (pronounced as “goron goro”). Ngorongoro conservation area covers 8,292 sq kilometres out of which 100 square miles is occupied by a crater, no kidding. By the time I was done watching this episode, I was in awe of Maasai people that occupy this region and it made me ask a much bigger question about our relationship with food and why humans have been so successful as a species. So bear with me for a few minutes and you will see that what we eat and how we live is an integral part of the environment we live in. Perhaps we need to look at a bit more than a cut and dry way of looking at food as dictated by some diets. Eating only raw fruits and vegetables or eat only fats and proteins may sound like just an imposition on what really should constitute a diet on which you can thrive. Ngorongoro is a very unique place and one of highlights is Ngorongoro crater. From Wikipedia “The crater, which formed when a large volcano exploded and collapsed on itself two to three million years ago, is 610 metres (2,000 feet) deep and its floor covers 260 square kilometres (100 square miles).” So basically it’s a big hole and because of its unique geography, parts of it are forest, parts are open grassland and parts bush land dotted with trees. Words don’t do justice, here is a photo from Wikipedia. 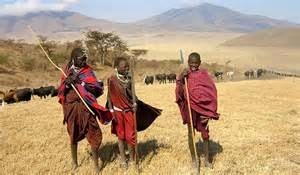 Maasai who occupy a big area between Kenya and Tanzania, share Ngorongoro with big game animals. You know, lions, cheetahs, bulls, rhinos, elephants. 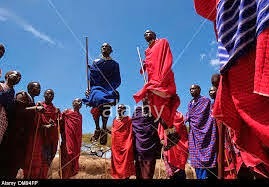 Maasai are interestingly herders. They have herds of cattle and goats and you can imagine the relationship between these carnivore animals especially the lions and Maasai. Lions would love to eat their goat and Maasai will have none of it. So Maasai fiercely protect their herd and what I can tell you is that when Maasai men have the spear in their hands, lions have learnt to keep their distance from them. The rite of passage (used to be) for a young boy to become a man was to kill a lion by himself using nothing but a spear! Even if that sounds like a bit of hyperbole, these guys have been tested for their physical fitness and their strength were considered to be of ‘Olympian’ level. Young men often jump high like this to showcase their strength and agility. 400 Maasai men had their blood work done and none of them showed any sign of inflammation or modern chronic diseases like diabetes 2, cardio vascular or coronary issues. In fact, Maasai aren’t any different from other modern hunter-gatherer tribes in this aspect. None of them seem to suffer from diseases of civilisation and they all eat varying ratio of macro-nutrients. Let's talk about Maasai diet. A lot of region Maasai occupy is arid and it's pretty amazing how they manage to thrive so well on seemingly so little. Remember they are herders and they have relied heavily on their herd to meet their food and nutritional requirements. Raw milk, raw meat and raw blood. They even mix and blood and milk. Yep, you heard that right. This is what used to be the bulk of their diet. So as you can see, they get plenty of fat and proteins in their diet. Which also brings me to the point that humans are obligated omnivores and this is a big reason why we have been so successful as a species. Wherever we have lived and whatever environment has offered, we have adapted to that and thrived on it. Humans haven’t insisted on eating only grass and vegetables and fruits (notice we don’t exactly have 4-cylinder stomach like cows) or being exclusive carnivores. If push comes to shove, we can live for long times as exclusive herbivores or exclusive carnivores. Now imagine a group of scientists walking up to Maasai and telling them that they have it all wrong. They should actually only be eating vegetables, fruits, nuts and seeds and absolutely no animals fat and proteins. Or they should be on a low-carb diet - that is eat high fat and moderate protein and they may want to take it easy on tubers. If I ever get a chance to spend time with Maasai I will just shut up and watch and learn from them. Having said that, I don’t mean to say that we should eat whatever we want. In fact, you and I live a lifestyle that is nothing like Maasai. That is fortunate and unfortunate. We live in a made up environment which provides us with unlimited variety of foods – whole foods, junk foods, processed foods, toxic foods. We are encouraged by corporations to take the short cut and eat whatever takes the shortest time. Maasai have lately incorporated Maize in their diet and they appear to be doing fine. But I absolutely don’t intend to start eating grains again. If you can live like Maasai, you can eat like Maasai. We on the other hand have to be careful about what we put in our mouths and what we do with our bodies. If you don’t think you are thriving, have a good look at your diet, sleep, stress and physical activity levels. For me, I have come to realize that I am thriving on a diet of whole foods – lots of plants – salads and vegetables, moderate high-quality meat, nuts and seeds. I like to eat as much whole foods as I can enjoy and no more. High quality dark chocolate, high quality and slightly processed oils and coffee also have a place in my diet. And ‘thriving’ is not an abstract concept or just a feeling. You can get the blood work done and know for sure that your bio markers confirm the awesome feeling. If you have specific issues you need to work with, LowCarbHighFat (LCHF) or high fat vegan or low fat is what you may need. I think it’s a big mistake to think that everybody in the world should convert to paleo or veganism or what have you. Basically eat from a list of foods and no more or no less. That doesn’t make sense because had we been like that, human species would have been extinct long ago.